Hopefully, the video showing approaches from Church, Fulton and Dey will be available to download. Even the IRT 1/9 station is open to the mezzanine. Here's a link to the Power Point presentation. The world caught its first glimpse today of the Port Authority’s enduring monument to the heroism of September 11, 2001, when world-renowned architect Santiago Calatrava unveiled soaring, spectacular design concepts for the bistate agency’s World Trade Center Transportation Hub, which will significantly improve mass-transit connections across Lower Manhattan. The glass roof above the hub’s freestanding grand pavilion, featuring ribbed arches that evoke a cathedral, will open each year on the anniversary of the September 11 terrorist attacks. Glass-and-steel wings will rise up to 150 feet. Natural light will reach rail platforms 60 feet below street level. Pedestrian connections that will significantly improve access to PATH, ferries and subway lines across Lower Manhattan. By 2020, these connections are expected to accommodate 250,000 daily commuters and visitors. Last summer, the Port Authority selected the Downtown Design Partnership, in association with Mr. Calatrava, to design the World Trade Center Transportation Hub. The partnership is led by the joint venture of DMJM + Harris and STV Group, Inc. – two of the world’s most successful and respected architectural/engineering firms. The permanent World Trade Center Transportation Hub will feature seamless pedestrian connections to the World Financial Center and the Metropolitan Transportation Authority’s proposed Fulton Street Transit Center. Lower Manhattan residents, commuters and visitors will enjoy far faster access to ferry service along the Hudson River, and to 14 Lower Manhattan subway lines – the 1/9, 2/3, 4/5, N/R, A/C/E and J/M/Z. The World Trade Center Transportation Hub also is being designed to accommodate potential rail service to John F. Kennedy International Airport or other destinations. A temporary PATH station opened at the World Trade Center site on November 23, 2003. The temporary station – the final piece of the Port Authority’s $566 million program to restore PATH service as quickly as possible between New Jersey and Lower Manhattan – was the first public space to open within the World Trade Center site since the September 11, 2001, terrorist attacks. Ridership at the temporary World Trade Center PATH station already is exceeding initial projections. The Port Authority of New York and New Jersey operates many of the busiest and most important transportation links in the region. They include John F. Kennedy International, Newark Liberty International, LaGuardia and Teterboro airports; AirTrain JFK and AirTrain Newark; the George Washington Bridge; the Lincoln and Holland tunnels; the three bridges between Staten Island and New Jersey; the PATH (Port Authority Trans-Hudson) rapid-transit rail system; the Downtown Manhattan Heliport; Port Newark; the Elizabeth-Port Authority Marine Terminal; the Howland Hook Marine Terminal on Staten Island; the Brooklyn Piers/Red Hook Container Terminal; and the Port Authority Bus Terminal in midtown Manhattan. The agency also owns the 16-acre World Trade Center site in Lower Manhattan. The Port Authority is financially self-supporting and receives no tax revenue from either state. What a relief! 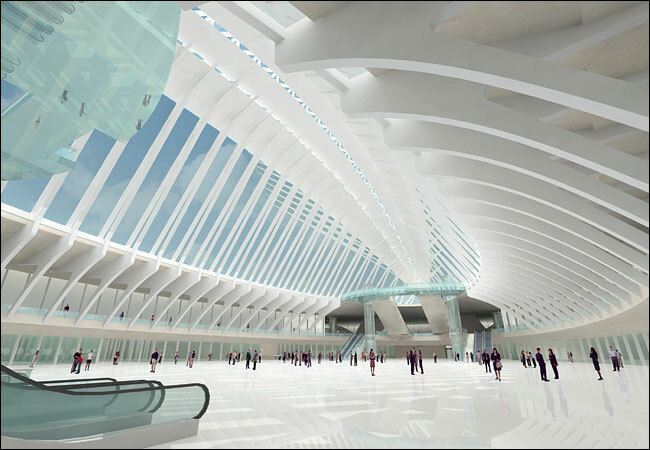 No less than what I expected from Calatrava, which is great. Flanked by world-class skyscrapers (Foster, Nouvel, et al), this is going to be awesome. I like how it's a free-standing structure, ameliorating the increasingly cluttered and crowded streetscape we were seeing in sucessive renderings. It works very well with the wedge of light concept, too. Everyone was taking it much more literally than it should have been, though it's hard to figure what Libeskind's original intentions were. The allignment of the whole building along that axis is arguably more meaningful than just a wall, as Libeskind intended. I don't know about the opening up every September 11th business; It's a little silly to open up to let the shadow of the Millenium Hilton in. Oh, and I love the transluscent floors. They're the one thing about the design that must be preserved no matter what revisions are made. The concourse of the old Penn Station had glass tile floors; it was something I would have liked to see. They're still there, under the terazzo. You can see the underside from some places on the lower level. Very nice design. On a side note, I wonder if it would be economical one day to construct an underground tunnel (with shuttles and/or moving walkways) to travel to Liberty and Ellis islands, and connecting to the transit hub or Battery Park. Am I the only one who is a little disapointed? The size and scope of this project is minimal compared to other projects he has done. It looks a bit liek a upturend hairclip. Im not totaly disapointed as this is much better than the FT but I was expecting great things from Signor Calatrava. Can someone explain to me this concept of glassy trans-lucent tiles. From the description they sound slippery. I like how the wings form a matrix of shadows and reflection on the floors. Am I the only one who is a little disapointed? The size and scope of this project is minimal compared to other projects he has done. At the presentation, it was stated that the structure is 350 ft long. Is there anything good in the Powerpoint presentation? I can't look at it on my Mac. Are the two wings of different sizes? Depending on which rendering you look at, they either look the same or different. I think the asymmetry would add a lot to the project, and would work well with any futuristic towers that go up around it. You can download a free Powerpoint viewer for Mac here.